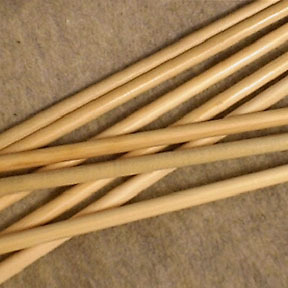 Arrowshaft material that consists of unspined shafts with defects that make them unsuitable for modern arrows. These are stiff and sound, but should be planed or sanded smooth as they contain minor small defects. These are unsuitable for shooting or sport archery. Our arrow shafts are selected for primitive arrow applications that will involve hand tooling the shaft somewhat to achieve a natural and hand-made look. These shafts will make fine primitive arrows, but are not suitable for shooting or sport archery. 31 inches by approximately 11/32"